I'm submitting my ESTA application and I have dual citizenship (Italian/Paraguayan due to jus soli). In order to submit my ESTA the application asks whether I was ever given any passport/ID card from some other country. 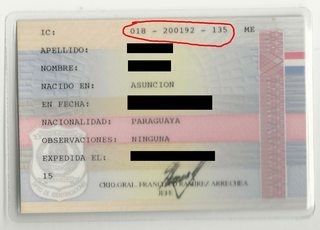 The answer is: yes, I was given a national ID card in Paraguay when I was a few months old. I have no idea which is my card number on this card. Is anyone familiar with this particular document? My guess would be that the number is the one on the front of the card, but I don't want to make a mistake. 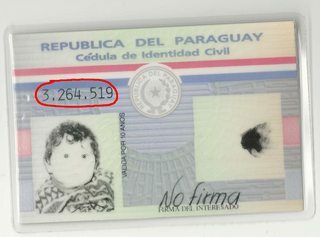 I sent an email to the Embassy in Rome with the pictures of the ID card and they replied saying that the number is, as I thought, the one in the front of the card: 3264519. Not the answer you're looking for? Browse other questions tagged usa esta applications identity-cards paraguay or ask your own question. Vessel and carrier number on the ESTA form if travelling by car from Canada?